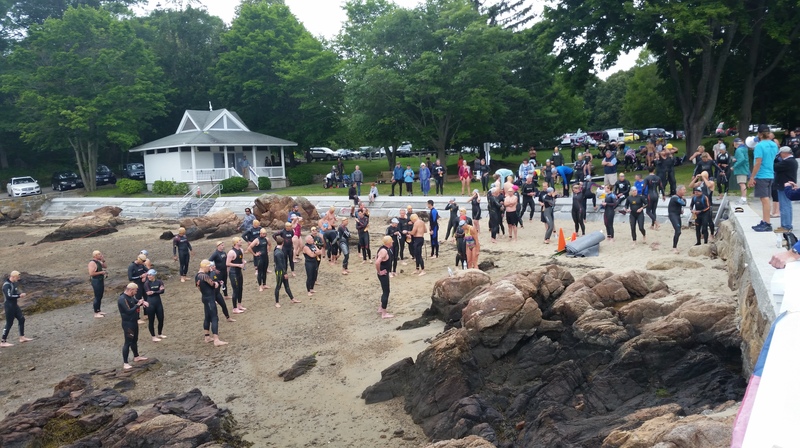 The night before the swim I woke up at 2am and frantically started Googling shark sightings in MA, so I was in a really good headspace… Still, the morning of the race I arrived early and checked in (“You’re number 63! Same as the water temperature!”), giving myself enough time to collect my family/bf (misery loves company, after all), wander around the staging area, and get my bearings. The pre-race instructions listed all the turns and buoys, but because we would start and finish in the harbor, there were a lot of turns and gates to keep us out of the boat channel. In theory that is great – more information is better than less, and I really didn’t want to end up in the path of a boat! – but in practice that meant that I found myself one of many people in the gazebo at the end of the pier looking for the various buoys while reciting turns to myself (“Right, gate, left, gate, right, right…was there a yellow one?”). I stopped short of writing them out on my hand, although I saw a few people who did that. Finally, I gave up and decided to do my best…and hope that the person in front of me was on track. The cool thing about the Misery Challenge is that it is actually four races. 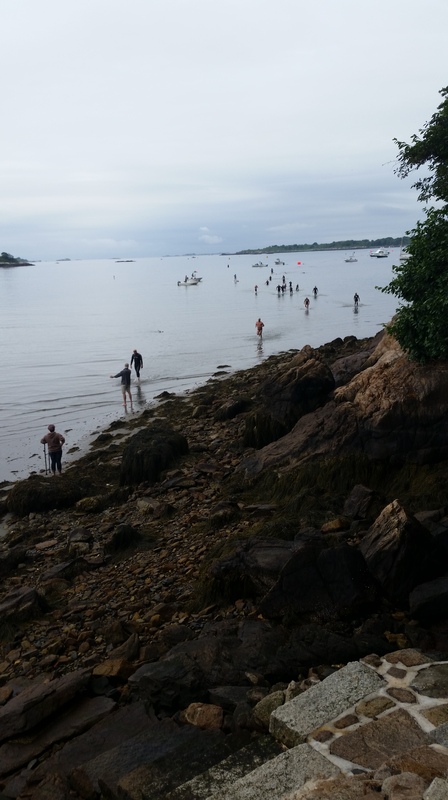 There is the three-mile swim out to Misery Island and back and there is also a four mile course, which goes out to and around the island before turning back, for paddleboards, kayaks, and skulls (is…that what they’re called? I only lasted two weeks in crew before I remembered I’m short). I wriggled into my wetsuit as I watched the paddleboarders and kayakers set off, and then I wandered down to the beach for the pre-swim meeting. Five minutes later, and we were off! It was a time trial start, so we lined up in pairs and went through the starting gate after our numbers had been taken down. 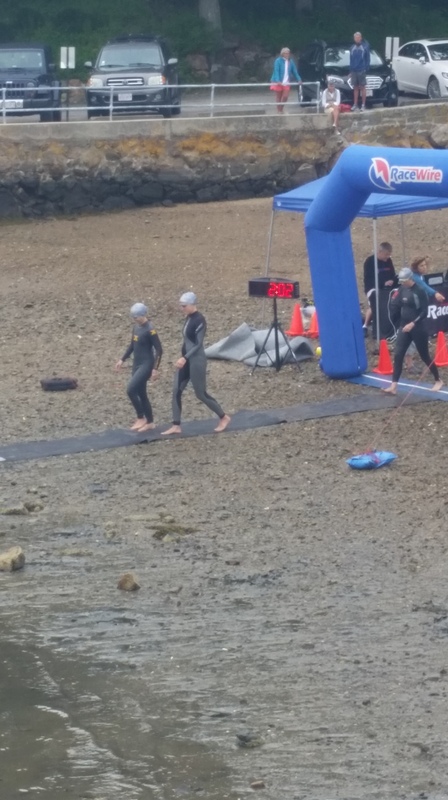 The tide was low which made for a bit of a rocky start, but the race team did a great job of clearing the biggest rocks and sharpest shells from the path and laying down mats to walk on into the water. Still much more civilized than the mass starts I’ve done in the past! There’s something refreshing about starting a race without getting any elbows to the face. 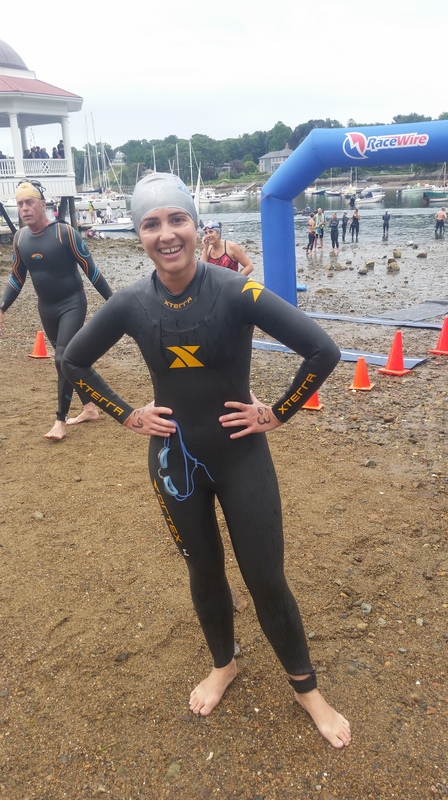 As I started swimming, I was grateful for the wetsuit. I got a touch of brain freeze as I first dove under, but it went away quickly. And all those confusing turns? MUCH easier to figure out in the water! I was only a little confused when it turned out that Misery Island was a different Island than I initially thought, but once I figured that out I was good to go. I settled into a good pace and got a good song going in my head (“Rest of my life” by Town Meeting. 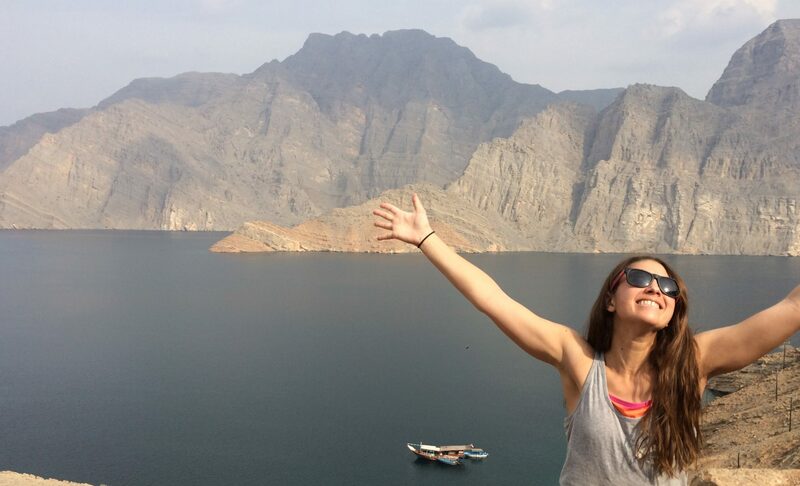 Something about the line “cold water on my head and my face” seemed especially relevant…). Because of the way we started, I was never in a pack of swimmers although I was never completely alone either. The water was calm throughout the race, with some subtle large, lazy, rolling waves during the longest stretch of straight swimming. I didn’t notice the waves lifting me up but as I came down the other side, it was be this weirdly unique feeling of swimming while being sort of sideways. I actually liked having those to think about since it broke up the stretch and kept me actively focused on the next buoy. After the turnaround point (helpfully marked by a triangular buoy as opposed to the other round ones), it felt fairly quick getting back to the harbor. This was the only point at which the course got a little confusing since I was also seeing the buoys from the way out. I knew I needed to keep them mostly to my right, but it is a little weird to see buoys and not head towards them. Fortunately, there were a good number of support boats there to keep us all on track. They pointed out the correct direction and blocked off incorrect turns. At one point I heard a lot of whistle blowing, and while I immediately thought “Sharks! Eels! Lightening!” it was in fact none of the above – just a swimmer being directed back on track. But good to know the hierarchy of my swimming fears, I guess. 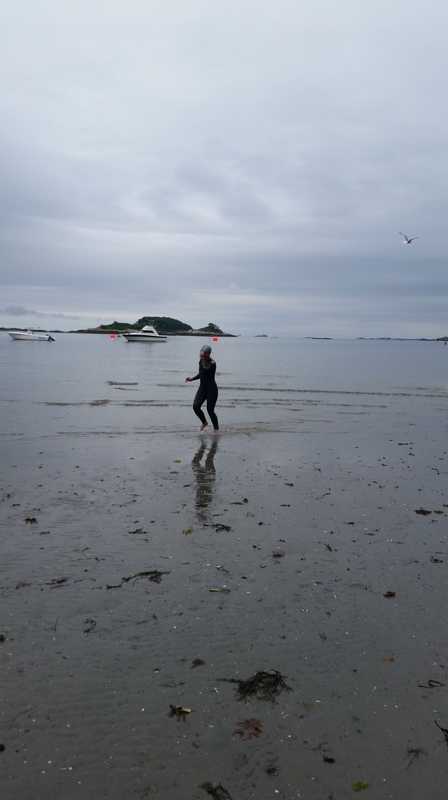 The swim ended on the beach closer to the mouth of the harbor than we had started and there was a short run to the finish. Again, the area was well marked and cleared of the biggest obstacles and while I was a little concerned about how my legs would do after three miles in the cold water, I managed to stand up and move without totally eating it. Which is sometimes all you can really ask for. 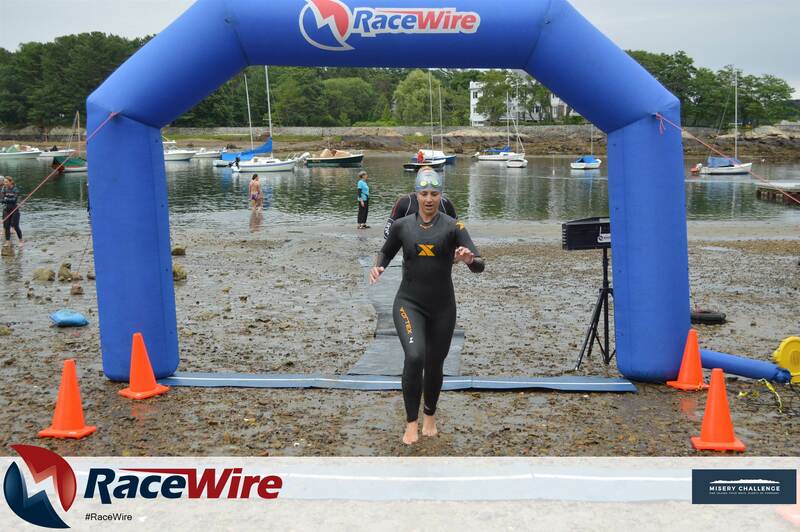 At the finish, I found my people and peeled myself out of the wetsuit. I managed to change into real clothes without hitting my chafe marks too badly and wandered over to the finish festival for a bit before heading back home. Success! And not even a little bit Miserable! Three miles is the longest I’ve ever swam continuously. I swim up to 2.5 in practice (inside) and while I probably came close to that distance on SwimTrek, we had water (and snack!) breaks and sometimes did the full distance over the course of the day, not in a single morning. So, you can imagine I was pretty happy to have finished this! I completed it in 1:23.21 which is a pace of about 1:34/100 yrds. One of the things I’m finding I really enjoy about open water swimming is how much the course and conditions impact the end result. I know that’s probably common sense, but I think it’s a nice change from pool swimming where I know my base pace and it remains fairly consistent. Much more of a challenge this way! And even better, it means I’m able to stay focused on the swimming and less on the numbers, which I enjoy more. As for the race itself, I was really impressed with how well everything was run. I fully expected to get a paddle to the head with all the boats out in the water at the same time as me, but in reality, I never saw the kayakers or rowers in the water and I only saw a few paddleboarders silhouetted in the distance against the sky as I turned to breathe. It can’t be easy to coordinate that many vessels in order to prevent them from colliding, and yet the organizers of the Misery Challenge did. I heard some complaints about the low tide and “long” run to the finish, and while I agree that higher tide would have been preferable, I also know that we took over an entire harbor, and so probably our timing was partially determined by safety from larger boats. If I had to choose between high tide and a boat-free course, I’ll take the boat-free course any day. And the run was actually kind of fun – it’s not every day I get to run around barefoot in the mud. The only suggestion I might make for next year would be brighter swim caps. The women had silver caps, and while that fit with the overall grey Misery theme, I didn’t feel as visible as I might have liked. The men were slightly more visible in gold caps and I noticed a few people who switched to their own brighter caps. As I said, I never encountered any boats on the water and with all the course support I felt very safe throughout, so this was ultimately fine, but just as a thought on the small things I might change. That aside, I was really happy with how this went. 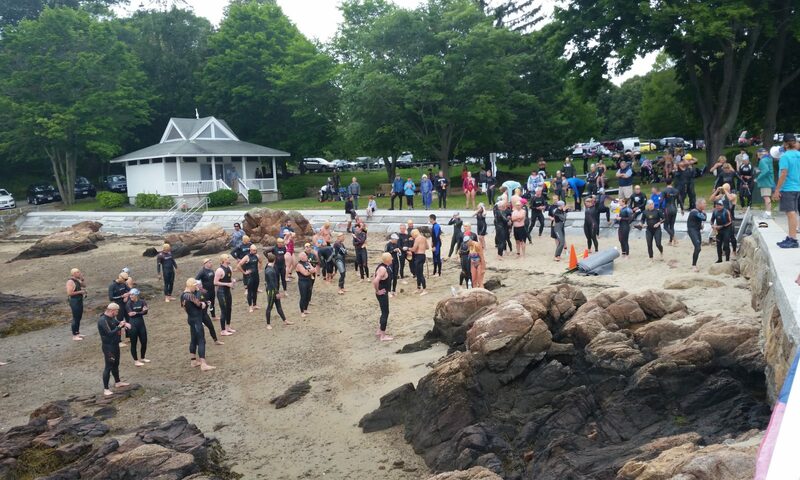 Manchester-By-The-Sea is beautiful and the race gave me a cool way of seeing it. I love the in-water perspective of new places! From talking to people before and after the swim, there are so many races I’d love to try next summer, but if the timing works out, I’d absolutely do Misery again.